Naked Baby Contest for 2012! Here's the info for the Naked Baby contest! Hope everyone has fun with this format!! 1. Entries due by midnight Pacific time on January 20, 2012! 2. You may choose any kit/sculpt you’d like, sky is the limit. 3. 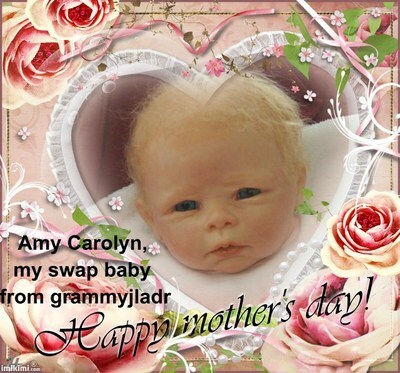 Babies must not have been shown on any forums prior to the contest. No discussion even of which kit you’re working on! We’re going to keep this an anonymous as possible. 4. 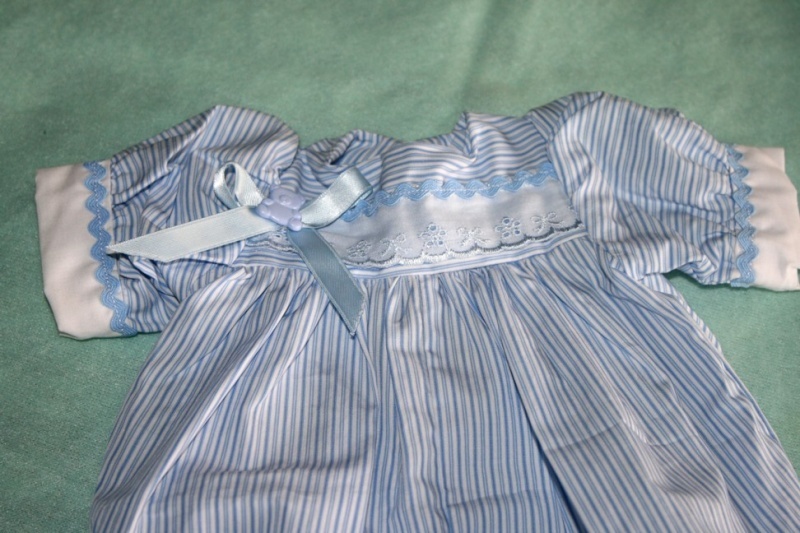 Babies may only be dressed in an unadorned onesie in a solid color, preferably white or pastel. That means no logos, art work, etc. Babies should have no extra accessories, such as pacifiers, booties, or hair goodies. 5. Send in three pictures taken against either a white or black background ONLY. One full body. One close up to show skin tones, mottling, etc. And a head shot to show rooting. You can use a blanket as part of the background but it must also be simple and preferably a solid color ... no identifying marks (ie logos or made by tags). You may not use any added props … this is a contest to judge babies, not your skill as a photographer! 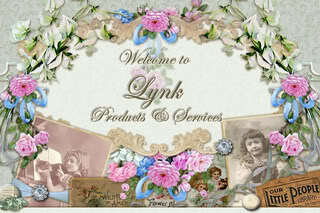 I will be putting together prize packages for 1st through 3rd place! Everything from clothing to props to one of my record book (or refill pages if the winner(s) already have one of my book. lol) And I know that several ladies have offered to add goodies to the pot so it should be an awesome prize! As it gets closer I will post pictures and a list of the prizes to entice you all! Voting will begin on Monday, January 23 and continue for 7 days. I hope everyone has a good time with this totally different concept for competition!! Awesome! Thanks, Sharon!! What fun! I'm hoping I can have a baby ready by then. I better get cracking on a baby to enter! You mentioned in the other thread that a blanket could be used, is this still ok or does the actual blanket need to be black or white? I have a piece of cloth that I can use as a backdrop but have blankets in pastel colours etc that I could lay the baby on? Hope i will manage to get one baby by then. Time will be a factor for me since I'll be gone for a month but I'll try. OMG no reborning for a month!! Thanks for catching that Sarah! I'll edit it right away. Oh yeah! Sounds like my kind of contest since I really stick at photos! I can't wait to see all the babies! OMG!! How fun this sounds I want to get in on the action and like Sherrie said getting to work thru Christmas, yes I want to, Hopefully my naked babies will arrive so I can get some ideas about them going one. I have one of your special nursery photo albums you made me and I so love it, I have a hard time keeping it from my grandaughter. She loves it to,. This sounds like fun! Hope to have baby ready!! Yay an excuse to buy a kit!! Sharon? Question for you.......are you going to separate the skin types in their own polls then have the winners of the polls go against each other? I realize a lot of that depends on number of entries of different skin type so I was just wondering....and that gave me an idea for a bi-monthly contest, too. I hadn't thought about separating based on skin types ... I think you're right and it will depend on the number of entries. My main idea was just to focus on the technique/skill of each baby. I'm not sure if we need different categories ... but maybe for painted or rooted hair? Toddler vs. baby? I was thinking of it being sort of like the colliii but without clothes or cute posing/props etc. We currently have a skin type contest going, I would rather see these separated by category such as hair/age etc, rather than skin if there is any separating to be done. I agree with Lyn, since we already have a skin contest. Yes, those categories are great idea. I just don't think you can compare apples to oranges very well so that's why I had the idea of splitting into categories. this will be something to look forward to, i have a few questions, is a onesie a vest that fastens underneath or a babygro? Yes, it would be considered a baby gro I think. Yeah, we in the US tend to use Gerber's name for the one piece outfit "Onesie" as the term for them. It's like calling self adhesive bandage strips Bandaids or powdery drink mix you add water and sugar to Koolaid, even though those are brand names not generic names. Ya'll are going to want to be working on your babies for this contest! Here's a teaser for the prize package! 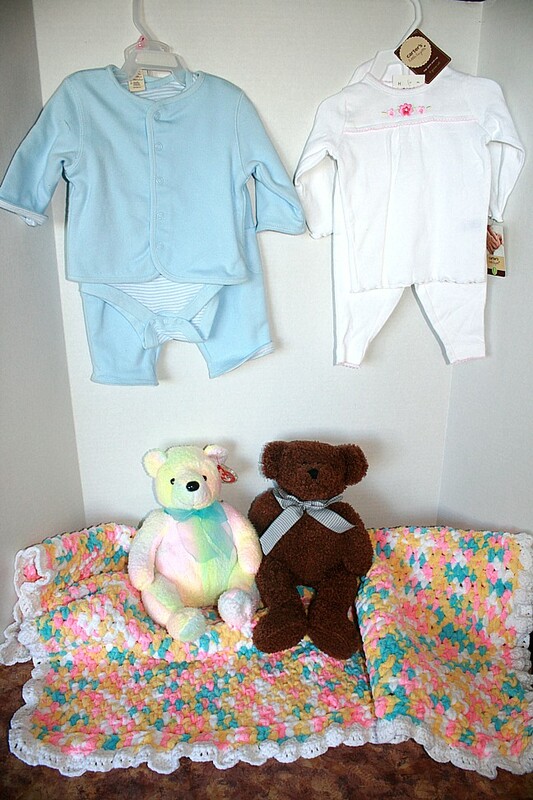 Boy and girl outfits, boy and girl bears, and a crocheted blanket! There will be more goodies added as time gets closer! Sharon I completely forgot to mail off something for the prize basket for you. When do you need them? If you like, I can hang on to it and send it direct to the prize winner? Yes, I think we covered this before. Onesie is a brand name that got used for the leg-less body suit. 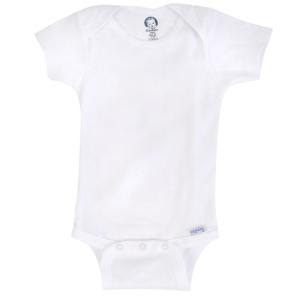 Onesies are by Gerber, but you don't have to use that brand. VERY nice package so far! Sharon you said one close up of the rooted hair, someone ask about if the baby is bald but my question is what if we decide to paint on the hair, is this okay and can the baby be bald or not? Thank you Sharon. Ok I just saw this what is a naked baby? 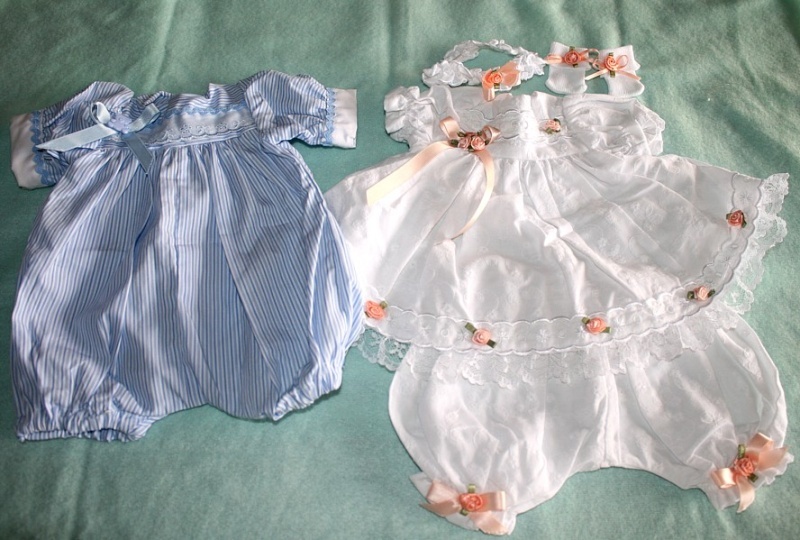 I know I know this is cruel to tease like this but I got a package in the mail Kym with two of the cutest preemie outfits! I'll post pictures tomorrow! Here are the outfits that Kym/babyblossom sent! They are TOOOO cute! Hope you ladies are getting ready!! oh wow i love them!!!!!!!!!!!!!!!! So painted hair is OK for the contest???? Since that's what I'd rather do. Just wanting to make sure...? 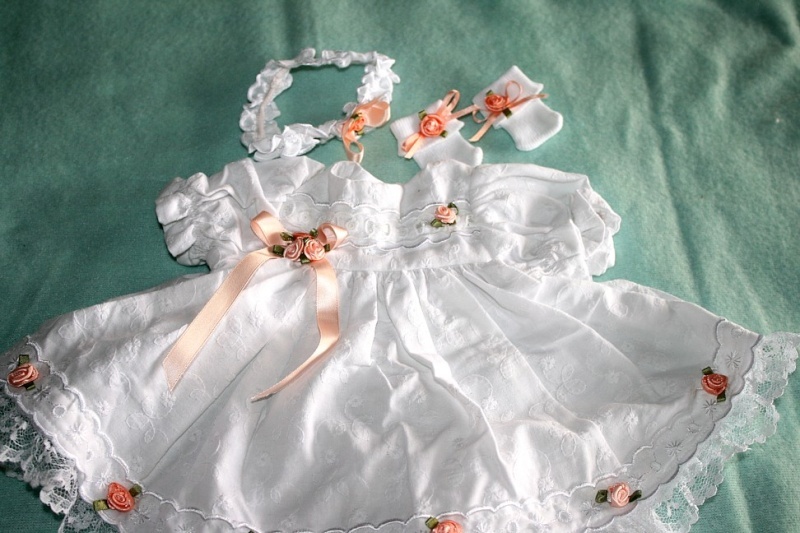 & BTW, those preemie outfits, especially the white one, WoW...are they gorgeous!!! They give us all something to really work towards winning, lol! They're really both beautiful!!! Kudos! It will depend on how many we get, but I'm very open to having a painted hair category as well as the traditional rooted hair! One doll per category and I just amended the info page to include rooted and painted heads! OMG i thought pictures were due by the 6th , then i check and it say the 20th ! LOL! I'd be in trouble if it was the 6th! I'd have been a lot more vocal (insert naggy here) if the deadline were that close. Sharon , would a light pink onesie with nothing on it be okay ? Subject: Re: Naked Baby Contest for 2012!